Why is being a homeschool group leader so exhausting and thankless? Here are some replies from other homeschool group leaders (my emphasis added). Some people just don’t know how to say thank you. We had a team of 5 leaders. Every semester, I gave them a small gift and thank you note, letting them know I appreciated what they personally brought to our group. Beth: Do you have a reliable team of leaders working alongside you? That has made all the difference as I’ve been in homeschool group leadership – as president as well as a numerous other roles – over the past 24 years. Our group grew from 20 families to almost 400 families during that time. There have been tough seasons and also smooth seasons. Make sure you prioritize and try to delegate or let go of things to minimize stress where you can. The leaders don’t plan everything, but provide the structure and administration for the group, and establish policies as needed. I started our group with 2 other moms, and we were the core at first. When we found like-minded people, we mentored them and encouraged them to use their gifts and talents for the benefit of the group. We really did find some wonderful people who saw that their own families benefited by their contribution. We worked hard to repeatedly convey the message that we all helped one another. We also have those who just want to be served, and it can be frustrating as a leader when you also “are busy” and have your own family to homeschool and care for. Melissa: First because the workers are volunteering so you don’t always get what you need from who is willing to work for free. It can be difficult to fill all the positions with people that will work as a team, complimenting each other’s skills. Sometimes you take what you can get. Second, you are working for a group of people that want a service. It’s not like you are all saving the whales. The parents want something. For as low cost as possible. Cheryl: Sometimes effective leaders seem to have it all under control in a way that makes others think they’re not needed. Those who stepped in in the group took time to figure out jobs that needed doing and clearly and repeatedly asked for help. And then let people run with those jobs rather than micromanaging them. Another difference I see is in expressing thanks. Leaders who manage teams well tend to be public and loud with praise on a regular basis—rather than criticizing often. Speaking about them to the group with thankfulness for their work, mentioning in emails or other group communication their hard work, giving out awards and certificates, etc. can help. Darlene Cheryl, this reminded me of another problem I saw in a group that I was part of several years ago. The leader of the group was a very capable woman. Someone in another role would falter or step away, and she would fill that role. After a few years, she wanted to step away from the head position. The problem was that everyone looked at her and said, “I can’t do that!” She was wearing too many hats! Her job looked daunting. We had to break down all she did into about a dozen positions before anyone would step forward to take on any of it. Sheri: Hmmm. Are you expecting too much? Too little? Giving too much guidance? Not enough guidance? Are you working with their personality type and not against it? Start with your WHY. Why do you exist? What is your vision? Then work on clearly communicating that vision. People will “catch” a passionate, clear vision and buy into it. Don’t try to be all things to all people; those who have a different vision, let them go with your blessing to find or start something else. I’d rather have a small group of committed people than a large group of apathetic people. We made our yearly planning meeting mandatory. We asked for ideas and wrote them on a whiteboard. Then I would ask who would run that. If no one volunteered, I just erased it off the board. One year our favorite event, a yearly picnic, no one stepped up and I erased it. I think members thought the board would just do it, but we did not. Everyone complained but we stood firm. That next year, it was quite simple to get a whole 5 person committee to step up and make it happen. Also, I paid attention to who was proposing events but never volunteering. As leader, I would take them aside and have a talk. Depending on what I discerned in conversation, I could approach it several ways. discourage them from asking for events that they wouldn’t also work for, etc. Even someone with a chronic illness can head a field trip with no cost; they can call the facility to arrange a date, set out a sign up sheet at meetings, and call the facility back with a final number. Sometimes they just need a little guidance. That’s helpful advice for Lesley and maybe you too! If you need help running your homeschool group my books can help. The IRS and Your Homeschool Organization. My Homeschool Organization Board Manual may be very helpful. It is a combination of a template for your board to create binders to keep important documents and a board training manual to explain the board’s duties and responsibilities. 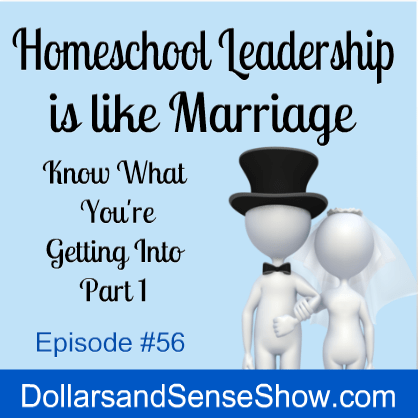 Leading a homeschool organization can be a lot like marriage. They both take time, money, and sacrifice, but can be hugely rewarding. Join Carol Topp as she addresses a group of homeschool leaders to encourages them in the important work they are doing, but also reminds them not to try and meet everyone’s expectations. 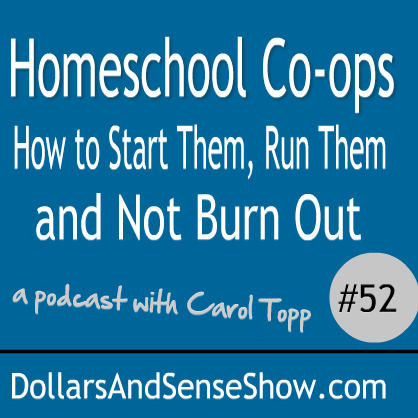 In her most recent podcast Carol Topp, CPA, the author of Homeschool Co-ops: How to Start Them, Run Them and Not Burn Out, covers tips to starting a homeschool co-op. Homeschool Co-ops: How to Start Them, Run Them and Not Burn Out has helped more than 1,000 readers run their homeschool co-ops. Get your copy here. Carol has more podcast episodes for homeschool leaders. View the topic list. 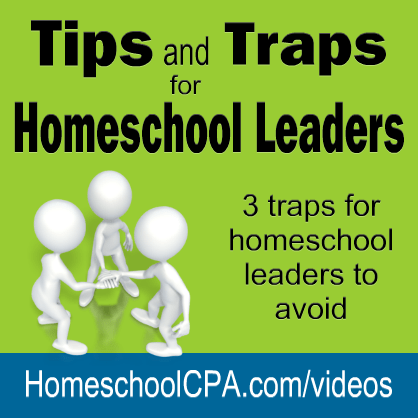 In this video I discuss the 3 traps the homeschool leaders need to avoid. I hope the video is helpful. Homeschool Co-ops book updated and has lower price! When I wrote Homeschool Co-ops in 2008, I was still homeschooling my daughters. Now, they are homeschool graduates, both in college, and I am no longer homeschooling, so I switched from the present tense to the past tense. I still interact with homeschool leaders every day though my website, leader online groups and by meeting leaders at homeschool conventions, so I added some additional information based on what I learned from these leaders. Website links have been updated and several changes from the IRS in Chapter Ten are included. Additionally, some of the uniquely Christian content has been adapted to appeal to all audiences. The book has a new cover to match some of my other books and so you know that you are reading the latest edition. The Kindle version is also $4.95. So if you have never read Homeschool Co-ops before, or your original edition is tattered and worn, order a copy today! Sarah Andrews did a nice review of my book Homeschool Co-ops: How to Start Them, Run Them and Not Burn Out at the The Home Educating Family Association website. Learn more about the book, read a sample chapter here. Thank you, Sarah, for your wonderful comments! I’m so glad the book helped your leaders reduce their stress and workload! 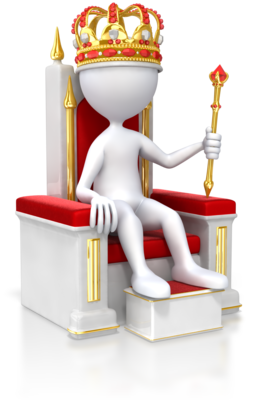 Does permanent leadership work in a homeschool group? Does there need to be a limit to how many times that person can serve on a homeschool group’s board, if she is still willing and the members still want her leading? Has anyone had permanent leadership in a homeschool group and seen it work? I have concern about a director or chair staying too long because it can create founder’s syndrome (“we always do it her way because she’s done it for so long”). But I have seen groups run successfully with the same leaders for 10+years. But, I would be concerned about burn out for the leader. I’m less worried about a secretary or other members staying on indefinitely. I do not think a treasurer should serve more than 3-5 years, even if she is doing a good job and wished to continue serving. Too many mistakes, or even embezzlement, can occur if a treasurer is not changed frequently. A treasurer unwilling to step down is a red flag signaling misappropriation of funds. The pope is appointed for life, but Pope Benedict just resigned. He’s just too tired and old (at 85 years) to continue to do his job. It’s the first time on 600 years a pope has resigned! In the USA, only the supreme court judges are appointed for life and it is debatable as to whether that system works! Your homeschool group is not the supreme court nor the papacy, so I would not recommend permanent leadership for a board member. My friends Kristen & Denise at Homeschool Group Leader have been running an interview they did with me as a blog series on leader burn out. But what those numbers on a budget do is help you plan, sit down and look to the future. That can do a lot to reduce stress. If you make a plan and know what might be coming, it will help you set priorities. What is important to us in our group? Is it important that we keep the cost extremely low? That is going to be a very different budget than saying our priority is top quality. It helps you focus, plan and set your group’s priorities. So, believe it or not–having a budget might sound like it is a limiting thing, and some people don’t like budgets. But instead a budget can bring great freedom and relief from a lot of stress. Then consider ordering my ebook, Money Management for Homeschool Organizations. Price $7.00. Available for immediate download. Read more here. As a guest blogger at The Homeschool Classroom, I wrote a blog entry about leader burnout. It is important to distinguish between temporary “busy-ness” or fatigue and full fledged burn out, which is accumulated strain and stress that affects other areas of your life. After nearly every co-op day, I feel exhausted. One fellow board member takes a nap after co-op, but she is only temporarily fatigued. We joke that we love when co-op starts, but we also love when it ends! A symptom of burn out would be the loss of the initial enjoyment and anticipation that co-op day should bring. I know that I am tired at the end of a long co-op day because I have invested so much into my students. I really enjoy teaching and I experience a “good” type of fatigue. Need help avoiding burnout? 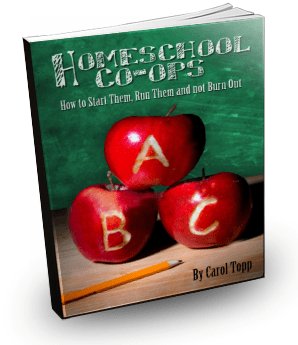 Read Homeschool Co-ops: How to Start Them , Run Them and Not Burn Out. Available as an ebook or in print here.